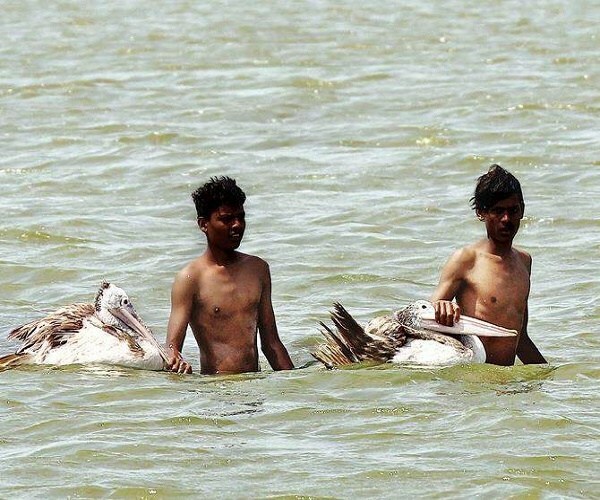 The poachers had successfully trapped three Pelicans, each of which would easily weigh 10 kg — One poacher broke the wing of a bird to prevent it from flying away. 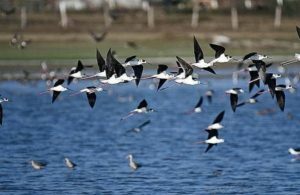 As migratory birds start to descend on city lakes as part of their annual journey, an organised gang is on prowl hunting them for meat. 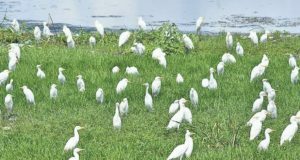 Himayatsagar lake, which was one of the three large water bodies refurbished by Water Resources Department recently, is attracting a good number of birds and is also turning into a den for poachers in Hyderabad. When #KhabarLive visited the lake, three boys in their early 20s were found hunting large waterbirds. They were caught on camera hitting the birds with a stick and dragging them out holding the beak. They were not amateurs doing it for fun or for the first time. The way they were hunting the birds indicated they were habitual offenders. One could see multiple traps laid in the portion of the lake, where large colonies of birds usually congregate. The poachers had successfully trapped three Pelicans, each of which would easily weigh 10 kg. One poacher broke the wing of a bird to prevent it from flying away. The other two birds were caught with bare hands. However, a few locals spotting the hunt raised an alarm forcing the poachers to leave their catch behind and flee on their two-wheeler. A local fisherman, acknowledged the fact that poaching happens regularly in Shamirpet lake from November to February. “Hunters are not locals. They usually set the traps at night and hunt early morning and at times in the afternoon,” he said and added that earlier this lake used to be the breeding ground for some of these migratory bird species. However, of late they come here only for roosting. When #KhabarLive brought the issue to the notice of Wildlife authorities, they promised to send a team to look into the issue. Shamirpet, Himayatsagar lake has got a bund now with cement concrete blocks on the lines of otherlakes. Also, there is a walkers’ track around the lake. Mearly 40 bird species are recorded in Himayatsagar lake, including Pelicans, Painted Stork, common Tailorbird, Asian Openbill Stork. It’s one of hot spots for migratory birds and has to be protected. The forest department should initiate measures to curb poaching activity. Meanwhile, ecologist R Ramachandran, who is conducting a detailed study on bird poaching in Telangana and Andhra Pradesh districts, said that it was a well-organised gang and the trade is lucrative fetching a poacher at least `15,000 a month. “We have completed two phases of our study and the results show 47 out of 53 species recorded in 27 lakes of Telangana were hunted. During the peak migratory season, a minimum of 20,000 birds are hunted daily. Although illegal, hunting has increased in recent years and is driven by market demand. We studied 1,200 sq.km of lake area and interviewed 272 hunters,” he said. ALSO READ: Hyderabad, Naturally A Cool And Pleasant City! Birders stumble upon fine plastic net stretched over 200 metres at Himayatsagar lake and many more lakes which are the birds heaven. Alomost all migratyory birds flocks to these calm and fonding places in Hyderabad. It was supposed to be a day of discovery of avian species for birders. Instead, they ended up discovering poachers. Participants at the Big Bird Day found a three-feet fine plastic net stretched over 200 metres. “We found two men with a parked autorickshaw using staves to slash at bushes in the backwaters of Himayatsagar. When we asked them about it, they said it is to shoo away cats. But we discovered a net that stretched to a great length,” said Kalyan Ineni, a member of Hyderabad Birding Pals, who discovered the trap. “Another net was removed by the poachers before the police and forest officials turned up” informed Ineni to #KhabarLive. This was not the first instance. A few week ago, when Ratish Nanda of Aga Khan Trust for Culture reached the Himayatsagar foreshore area with his camera to photograph birds, he was threatened by a few men who cleared the area of bushes and lit it up. Bushes are one of the key indicators of bird life with a range of small birds thriving in healthy environment. The poaching activity is not limited to Himayatsagar and Osmansagar. Another birder, Ravi Jillapalli, who has been tracking poaching activity on the campus of University of Hyderabad, says there have been multiple instances including one where a stray dog got trapped. “Security has increased on campus but there are many weak points in the boundary wall which is used by poachers to get inside the 1600-acre area,” says Mr. Jillapalli. “We have discovered nets to trap peacocks and koels, metal traps for rabbits and deer and new trapping pit which is clever in an evil way,” he says. Hyderabad has seen a surge in bird count over the past few years due to rising awareness about environment. Ineni’s team discovered 60 species in a span of a few hours. How Young Men In Telangana Are Lured Into ‘Clinical Trials’? Now, A ‘New Rule’ Will Change Your ‘Salary Reimbursements’ Under GST?